National Winner. His doodle “Pirate Times” will be featured on the U.S. Google homepage tomorrow, May 18. 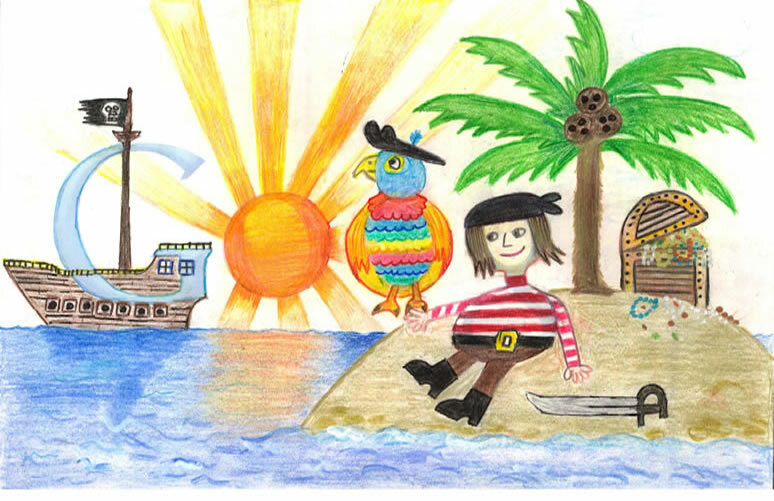 Hoffman, who attends the Prairie School in Racine, Wisc., responded to this year’s theme “If I could travel in time I’d visit...” with a colorful depiction of his dream visit to an era filled with swashbucklers. There, he’d “sail a pirate ship looking for treasure, have a colorful pet parrot and enjoy beautiful sunsets from deserted islands.” With his win, Dylan has come into some treasure of his own: a $30,000 college scholarship, a Chromebook computer and a $50,000 technology grant for his school. As an added bonus, Dylan’s doodle will grace the front of a special edition of the Crayola 64-crayon box, available this fall. After the awards ceremony in New York City today, all 50 of our State Winners will unveil an exhibition of their artwork at the New York Public Library, where their doodles will be displayed from May 18-July 19. In addition, the artwork of all our State Finalists and Winners will be displayed at exhibitions in their home states across the country over the summer. Be sure to check out the local exhibition near you. Thanks to all of you who voted and helped us select this year's winner. Even more important, thank you to all of the students who submitted entries. Keep on doodling and we’ll see you next year! After 114,000 submissions and millions of your votes, second grader Dylan Hoffman of Caledonia, Wisc. is this year’s U.S. Doodle 4 Google National Winner. His doodle “Pirate Times” will be featured on the U.S. Google homepage tomorrow, May 18.